I had never heard of blade tenderized meat before I read an article in USA Today about this. My first response was that it seemed more natural than chemical tenderizing, so that sounded good. The process raises some health issues. Because the blades penetrate the meat, it's possible that contamination can be transferred from the blades or the outside of the meat deep into the meat. Of course, the blades and the meat are clean; nevertheless, it's important that just in case, when cooked, the meat is heated to a high enough temperature to kill bacteria. Blade tenderized meat should be cooked to the same temperature as hamburger; both have the same possible contamination issues. 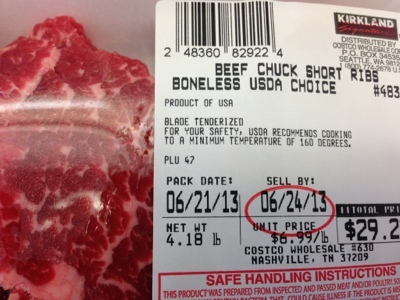 It's important to label meat that has been blade tenderized so chefs know that the meat needs to be cooked thoroughly. You can see the labeling on the photo I took yesterday at the West Nashville Costco. Again, Costco is the good guy.